thank you gift from us as one of our valued Referral Ambassadors. 1. Give us the name of a friend or colleague who travels or attends festivals and is not a current Director's Choice customer and help us connect with them. 2. If our products and services are a good fit for your referral’s needs, we will send them a custom proposal. 3. As soon as a proposal is sent to your referral, we send you a gift card based on that proposal as a thank you for recommending us. 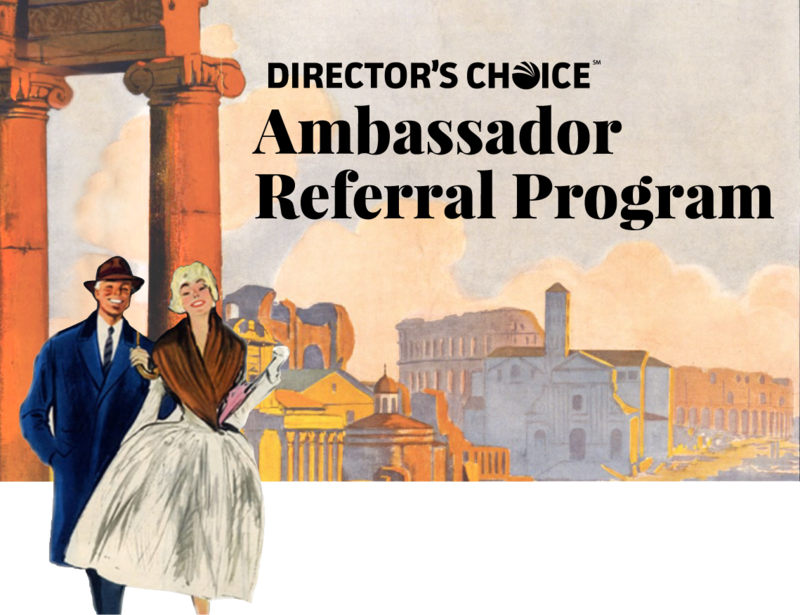 Director’s Choice does not engage in ‘kickbacks’ or the payment of referral fees related to a music program being managed or directed by the person making the referral. We appreciate the encouragement of your direct associates to utilize our services, but Director’s Choice rigorously respects the spirit of school district anti-collusion policies. No teacher, parent, or administrator will be compensated for successful referrals made related to a program he/she directly supervises.